Local Beer Blog: Finally: Homebrewing in Panama! I found a nice price on this Adventures in Homebrewing 9-gallon kettle through HomebrewFinds.com. I added a Blichmann Thermometer and a stainless steel ball valve and saved at least $60-$160 by going the "Frankenstein" route. 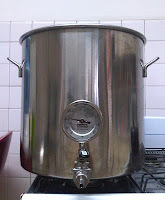 Some brew kettles can run you $300 or more! After boiling wort for an hour, it's important to drop the temperature of your wort as quickly as possible so that you can pitch the yeast. If the wort is too hot, the yeast will die. The longer it takes to chill your wort, the more likely it is that wild yeast or bacteria will infiltrate your beer. A plate chiller, such as this one, helps accelerate the cooling process. As a beginning homebrewer, I used to just make an ice bath for the kettle. Now that I'm boiling upwards of 5 gallons at a time, the ice bath won't cut it any more. Enter the plate chiller. A plate chiller is made up of alternating compartments. Through one set flows your hot wort, through the other flows cold water, removing heat from the wort. Some people use an immersion chiller , but I figured the plate chiller would take up less space and be easier to transport. This guy's just a screen that screws into the inside of the kettle, preventing any hop trub (brewspeak for "gunk") from leaving the pot and clogging up the plate chiller. For the BIAB method, the grains go in the bag and the bag comes out at the end of the mash. Sanitize - Every method of brewing, no matter what level, requires impeccable sanitation. Anything that may come in contact with your wort must be thoroughly cleaned and sanitized. I use Five Star PBW, an eco-friendly cleaner, and Star San Sanitizer. Heat the water - BIAB calls for a full volume boil. Taking into account that some of your water will evaporate, you actually start with more water than however much beer you plan on making. I started with 6.5 gallons, planning to end up with 5 gallons of beer. It takes a while (over an hour) to heat up that much water on a kitchen stove. Put your mesh bag in the kettle and mash in the grains - Different processes call for adding your grains at different points. Some "dough-in" when the water reaches 110F - 120F. The infusion mash method calls for adding your crushed grains when the water reaches 160F - 170F, then holding the temperature between 150F and 160F to convert the starches in the grains to fermentable sugar. The mash usually takes 60-90 minutes. Check the pH level - To convert the starches, your mash needs to have a pH level of 5.0 - 5.5. My mash water pH was a bit high, so I added a teaspoon of gypsum to bring it within range. Pull out the bag (sparge) - When the mash is complete, all you have to do is pull out the bag. Ten pounds of dry grain, now water-logged, weighs a good bit, so be careful not to rip your bag! Chill wort - Kill the heat and pass your wort through the chiller and into the fermentation vessel. Pitch yeast - When the wort is 90F or less (depends on the strain), it's safe to add the yeast. Seal the fermenter - Close it off with a rubber stopper and an airlock, which allows CO2 to escape, but keeps air from the outside out. Let the magic happen - Give the wort a couple weeks to ferment. More or less derived from my Amarillo Pale Ale recipe, this brew is meant to address the deficiency of American hops found here in Panama. 1. Boiling 6.5 gallons takes a long time. Next time, I'll consider heating my water in two separate pots then mixing them together. 2. Brew in a Bag - It works, but -- dealing with that straining bag is a little tricky. A bungie cord is pretty essential to help keep the bag in place. 3. All-Grain - I had a little trouble gauging pH using the test strips. I'd recommend investing in a digital pH meter for both ease of use and accuracy. I also found that the color of the finished wort came out much lighter than I expected. Apparently malt extract adds a lot of color to your beer, so when brewing all grain its crucial to choose the right malts to give your beer the color you want. 4. Shirron Plate Chiller - It works pretty well, but I had some issues with the barb/hose connections. By using Teflon tape and hose clamps, and by placing the Shirron at a 90 degree angle, I was able to prevent any major leakage. I recommend making sure you have a tight fitting between the hose and the plate chiller. So a few issues, but hey, one of the things I like about brewing is the constant experimentation, problem solving, and DIY. I can't be stopped! Stay tuned -- I'll let you know how it turns out! So how did it turn out? And where did you get your ingredients? Ingredients were mostly purchased in the US and carried in by plane. I'll keep everyone up to date on local sourcing when it happens. Are you based in Panama? No, but my wife is from Panama. We were married in 1988 and have been thinking about moving to Panama. We currently live in Milwaukee, Wisconsin. If we do make the move, I'm hoping to do something in the brewing arena. Craft beer, brewing and beer culture are my passion. I'm a homebrewer with 18+ years of experience. I've been doing some research from afar and stumbled across your blog and I'm very intrigued. After my last post I realized that your beer wasn't probably ready yet as I noticed your brew date. The beer pairing dinner sounds like it went off well. It's a great idea to try to get people to start thinking about beer in a different way than what they are used to. I was also happy to see that there are a couple of local craft brewers in Panama now. I'm very curious about how they are sourcing their ingredients and about any challenges they are having when it comes to water and refrigeration. I'll be keeping my eye on your blog. Best of luck and hope to hear more soon. Ken, thank you for your support. Craft brewing in Latin America is very exciting right now. I hope to have some answers to your questions about sourcing, water treatment, and refrigeration on the blog soon. Let me know if and when you make it to Panama and we'll go get a beer! where do you get your barley?? ?...called all over and came up empty. I carried most everything in my luggage from the US. There's a BIG opportunity for someone to open a homebrew supply business in Panama. It might be worth looking up TicoBirra and La Bodega de Chema in Costa Rica. Also investigate Mexico and Colombia to see if there are any options there.